I was delighted to be asked to give the keynote address at the 2018 RAD Conference in Brisbane during January. I will not, for copyright reasons, be posting my paper and PowerPoint presentation for the moment. I would, however, like to mention the surprise discovery (a surprise to me anyway) I made while preparing the paper. While examining the development of the Romantic tutu, and its relationship to changes in ballet technique at the time, I came across some interesting information about the forward tilt of the body that we often associate with the Romantic period—think of the Act II pas de deux in Giselle when Albrecht holds Giselle in arabesque as she moves her upper body forward. Despite advances in technique that were being made during the Romantic period, and the freedom that was gained from having costumes made with softer fabrics, such as the muslin from which the long Romantic tutus were made, there were nevertheless some obstacles to technical development. While the skirt of the Romantic tutu certainly gave the dancers more freedom, the bodice of the costume still had a stiff under-corset. Such a costume restricted the height at which the leg could be lifted. When the leg reached a certain height, say in arabesque, the hip hit the corset. This meant that lifting the leg any higher than 90 degrees became difficult and probably painful. I was fascinated to learn that this inability to lift the leg higher than 90 degrees without some kind of pain is most likely the origin of the forward tilt of the torso that we associate with the Romantic style. 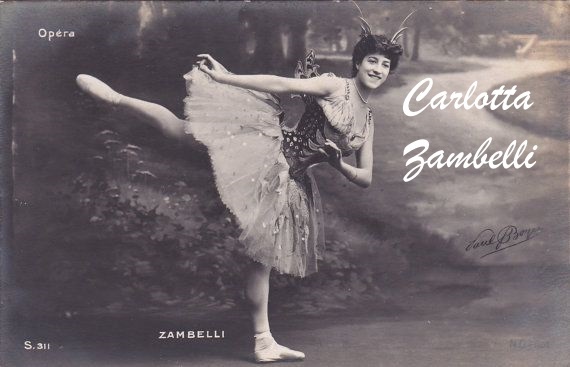 And with the image of Carlotta Zambelli I have used as the featured image for this post that tilt can be seen clearly, as can her tightly corsetted upper body. Interesting information as was your keynote address Michelle. Also love this image of Zambelli.